Amal Clooney is a woman of many prints. Whether it’s leopard for date night or florals during a work trip, we find ourselves frequently admiring the human rights lawyer’s pattern play. Accordingly, we thought we’d round up our favourite printed ensembles along with shopping to get her look. Scroll down to check them out! On Clooney: Dolce & Gabbana top and bag. Amal Clooney at Kappo Masa restaurant in New York City. On Clooney: Paul & Joe coat; Giambattista Valli skirt; Dolce & Gabbana earrings. Amal Clooney at a hotel in Florence. 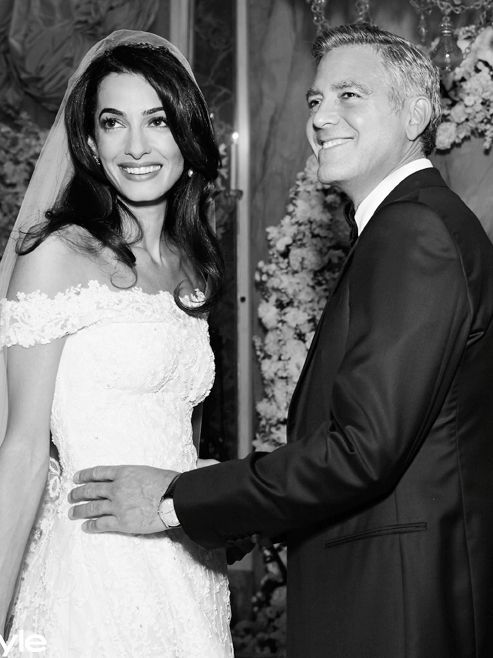 On Clooney: Oscar de la Renta dress. Amal Clooney leaving Patsy&#039;s restaurant in New York City. On Clooney: Giambattista Valli coat; Stella McCartney Sunfaded Flare Jeans ($385). Amal Alamuddin Clooney in Venice, Italy. On Clooney: Giambattista Valli dress. Amal Clooney in New York City. Amal Clooney at the London airport. On Clooney: Dolce & Gabbana dress. On Clooney: Giambattista Valli top and pants. Amal Clooney in Los Angeles. On Clooney: Etoile Isabel Marant jacket; Giambattista Valli Tiered Silk Georgette Dress ($3250) in Red Floral Print. Next up, find out how Amal responded when asked "Who are you wearing?" while in court.